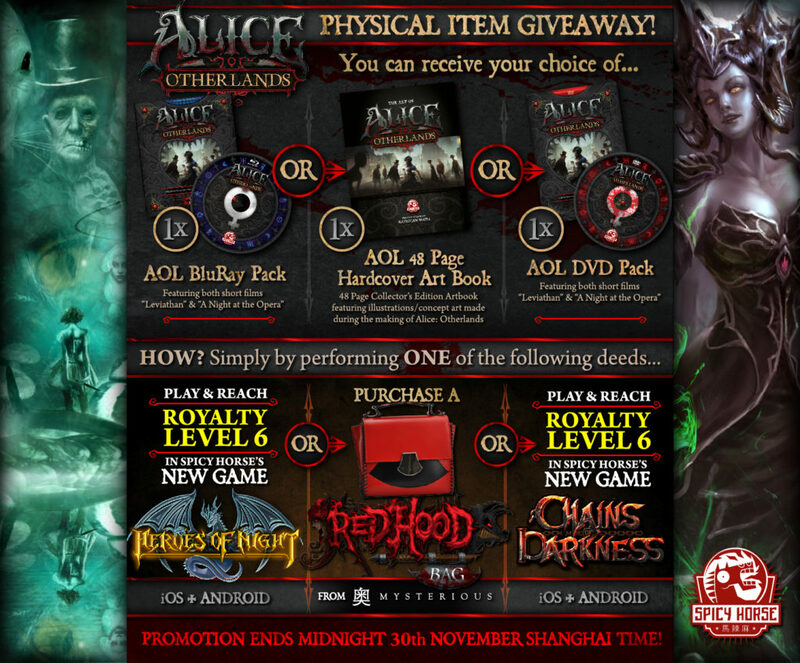 Did you miss your chance to grab physical rewards during the Alice: Otherlands Kickstarter campaign? Fear not! Due to overwhelming demand from fans around the world, we’ve put together a triplet of promotions you can use to acquire the Otherlands “Art of” book, DVD, or BluRay. You can complete these promotions as many times as you like and choose a reward each time. When you reach Royalty Level 6 (also called VIP level)* in either game, contact Spicy Horse Support and provide your reward selection, full name, address, and phone number. When you purchase a Red Hood Bag, include your reward selection in the purchase notes, or contact Mysterious with your reward selection and it will be mailed to you automatically. Promotion ends at Midnight, 30th November, 2015 – Shanghai time. Royalty Level achievements or claims submitted or purchases made after the promotion end time will not be accepted. This promotion is retroactive – if you’ve already achieved Royalty Level 6 (or above) in either game please contact support with your reward selection, full name, address, and phone number. If you’ve purchased a Red Hood bag, contact Mysterious with your reward selection and it will be mailed to you automatically. *Click the top banner on the main screen to access your profile and see your VIP Level. We reserve the right to reject reward claims that subvert the intention or spirit of this promotion. The “Alice: Otherlands” Kickstarter campaign is CLOSED. If you are a Backer and need to change your mailing address for Backer Rewards, please do so via Backerkit. Due to legal restrictions we are NOT able to offer physical items (Backer Rewards) for sale outside of the Kickstarter campaign. That means if you missed out on the opportunity to back the campaign you cannot buy the physical backer rewards. If the the situation with the legal restrictions changes, I will post an update via Kickstarter and here in this post. Please note that the digital content (animations and art book) WILL BE released to the public, for free. It’s the physical items we cannot sell outside of the Kickstarter campaign. Current estimated release date for physical items (Backer Rewards) is sometime around October 2015 (yes, we are late!). Digital assets will be released, for free, around that same time. As soon as we know how/when we’ll be releasing the digital assets, an update will be posted here, on Kickstarter, Facebook, etc. Please, do not write asking about timing for release of the digital assets. All info on this subject will be posted to the KS page. A final note regarding physical rewards: We cannot sell them, but there are no restrictions on giving them away for free. I will try to find ways to link these items to other things you might purchase from Spicy Horse or Mysterious. Keep on eye on my Facebook, Twitter, and this blog for details on future offers. For more info on the project and its progress, please read the campaign updates on Kickstarter. June 9th, 2015 – Animations Complete! Jan 8th, 2015 – Happy New Year 2015! Aug 5th, 2014 – One Year! Feb 21st, 2014 – Missing Posters Follow Up! Feb 10th, 2014 – Time to Find the Missing Posters! Jan 23rd, 2014 – Dude, Where’s My Poster?! Dec 16th, 2013 – Get Those Walls Ready! There are additional posts, going back further in 2013. To read them, please follow THIS LINK. If you have additional questions not covered by this post, please send them to me via Kickstarter. To everyone who backed the campaign and has expressed interest in Otherlands, Thank You!